Poll: who was our Player of the League for 2019? Over the last few years I’ve run a poll here on the site to determine who was our Player of the League in the campaign just concluded. David Clarke won the inaugural award in 2017 while Eoin O’Donoghue scooped the prize twelve months ago. As an aside, I’ve also run a Player of the Year poll in recent years but omitted to do so last year. It didn’t seem like the right thing to do in the aftermath of Newbridge and then we headed off on our hols so, to be honest, I forgot all about it. Maybe it’s just as well – the less said about 2018, the better. But 2019 has started off in a far brighter vein for us so it’s only right to seek to identify who you think was our outstanding performer this spring as we won the National Football League for the first time since 2001. I’ve compiled a shortlist of five players for this year’s award and, as in previous years, I’ve used the data from the Man of the Match polls in all of the League games we played to do this. This isn’t an overly scientific exercise – all I’ve done is add up the votes every player got in all the matches we played, with the top five making the shortlist – but it is an objective one and I think the shortlist reflects this. Okay, then, in alphabetical order, the five players who received the most votes cast in the MOTM polls for this League campaign and so make the shortlist for this year’s League Player of the Year award are Fionn McDonagh, Kevin McLoughlin, Diarmuid O’Connor, Aidan O’Shea and Matthew Ruane. Well done to all of them for making the cut. Aidan O’Shea is the only one of the shortlisted quintet to start in all eight League matches we played. Team captain Diarmuid O’Connor started in seven games, he missed the Dublin match through injury, while Mattie Ruane started in six games and also came on as a sub in another. Fionn McDonagh’s first appearance was off the bench but he then started in the next five matches before injury ruled him out of the last two. Kevin McLoughlin started the three final games, having come on as a sub in the four matches before then. All five shortlisted players won MOTM awards during the course of this year’s Division One campaign. Fionn got his one for his cracking debut performance against Tyrone, Mattie got the gong for his very solid display in difficult conditions against Galway, Aidan picked up his for his barnstorming shift against Kerry in Tralee, Kevin’s 2-2 haul against Monaghan did the trick there and Diarmuid’s captain fantastic display in Sunday’s final saw him pick up that one. Three other players, by the way, who didn’t make it onto the shortlist also got MOTM awards during this spring campaign. Rob Hennelly (against Dublin) and Jason Doherty (Roscommon) were sixth and seventh in the table for votes cast and so narrowly missed out on inclusion in the shortlist. Ger Cafferkey also collected a MOTM award – for the Cavan game – but absence through injury affected his vote-getting opportunities over the course of the campaign. Right, enough chat – time to get voting. This is a one-vote-only, winner-takes-all poll, which I’ll leave up till early next week or so and then declare the winner. Best of luck to all who made the shortlist for the award this year. Who was our Player of the League for 2019? Aidan for me. He had a sensational league since being moved back to his best position in midfield. Watching the final back, it’s amazing to see how much he controlled the tempo of that game while he was on the pitch. He looks fitter than ever as well. Between our two midfield men I think. Just went for Ruane because of the incredible improvement he showed throughout the league & the fact that he has himself a nailed on starter. McDonagh was well on course prior to his injury, I’m expecting him to have a big say this year. Aido..what a player. He showed such leadership all through the league, but second half of final was something else. The s….he has had to put up with on and off the field – I don”t know how he sticks it. He is pulled to the ground and somehow he ends up with a yellow card. He so good to the fans. Aidan O’Shea it has to be for me. Brilliant all through the league. I would add that I think Mattie Ruane has been the best find for Mayo in years. Our midfield has been as good as any Mayo midfield I have ever seen. I hope they can keep their form going in to the Championship as they are really helping to light up our forwards as well. Aidan for me too. He is playing better than ever. Immense leader. Also his strength of character in putting up with all the abuse he gets in the media and from our own supporters and not to mention on the pitch. He doesn’t get half enough credit in my opinion. Kevin is one of my favourite players over the years. I voted for Ruane, twice he came up with big big goals just as they were needed. Looks built for croker, and theirs a bit of fenton about him. Just the type of player we needed after Toms injury. The real player of the league for me is James Horan. He some how managed to bring in so many new players, and win the damn league in the process. I’d a been happy with survival, never mind winning it. Whatever happens thhis summer, the future is bright for us. All 5 have been excellent, but for me it’s Aidan for the consistency of his performances. He ran the show on several occasions throughout the campaign, and he looks happy in his football again which is a great sign for the summer. Aidan for me – the driving force behind the team and restoring him to midfield could well be the switch of the year. With Parsons and Sheamie missing I thought we’d really struggle there but Aidan and Ruane will be very hard to replace now. Great to see that two newbies made the shortlist. Who could have foreseen that ? Although Kevin Mc Loughlin is my favourite player … Aidan was definitely our player of the League! Hope he brings this form to championship! Could only be Aidan for me. Like many others have said, he’s the one driving the team, and if we’re honest for some time now. There is a sense that the move back into the middle of the engine room has brought even more out of him. He’s also been enabled to bring so much more out of those around him, with his clubman Mattie Ruane being a good example. I’d back Aidan against anyone around the middle if we can set up properly around him. That’s the challenge that lies ahead. I didn’t think Ruane started 6 games wj but maybe old age is creeping up on me? AOS got my vote. Hes vital to everything Mayo do. Look just as the last day, gets booked for being wrestled to the ground. Next thing RH kicks the ball 60 mts and AOS catches it between 2 Kerry men. I could go on and on. He’s dragged us through matches and saved us on so many occasions. He’s wasted at 14, between the 2 45’s he’s unplayable and now he’s unlocked sublime kick passing from his armoury hes stepped up even further. The 2/3% that’s hes missing is to kick 1/2 points during a game. Nail that’s and he’s 10/10. Full credit to the other nominees too. Aidan all the way. No contest. I’m tentatively making a re appearance here after getting a (deserved smack on the hand, in hindsight) last week. Apologies Willie Joe, it won’t happen again. It’s gotta be AOS player as MVP. The league really is a fantastic competition. Wouldn’t it be great to see a Champions league style format for the championship some year. A proper CL format, seeded teams, 8 groups of 4 etc etc. Aidan O Shea gets dogs abuse on and off the field. I know a well known pundit and he told me Mayo would never win an All Ireland with Aidan on the pitch. I told him watch the final again to see the impact he had on the game and the amazing role he played pulling us through the qualifiers that year. He was outstanding again on Sunday and looks sensational this year so far! Should have said that comment came after the 2017 final. Aiden for me too. What a brilliant consistent league and better with each game. Got so many turnovers that mattered at end of games. All the others were brill too. He did, JP2 – he came on as a sub late on in the Tyrone match and he started in every match after that so that was five regulation rounds plus the final. He’s an old hand by now! The league was 8 match’s for us… going on the performance during all 8 different match’s, it can only be Mathew Ruane, excellent in every Match he played, including the one versus Dublin, where very few Player’s performed… I think Fionn McDonagh, had he stayed injury free would be much higher up the voting, hope that he plays a big role for Mayo in the forthcoming Championship. .. Aiden was magnificent in both Kerry match’s, and really upped his performance level when placed at midfield. But in my view, you have to take the league as a whole, therefore it can only be Mathew Ruane! Voted for Aidan. Massive All through. Would like to see a compilation of his passes throughout the league. Tyrone and Kerry x2 come to mind. Has to be Aidan. What a beast of a man on the pitch. He gets stuck in from the get go and just drives the team on until the final whistle. Such a joy to watch. The way he lifted that cup last Sunday shows what it meant to him and indeed the roars from the crowd showed just how much he Is truly appreciated and adored by the Mayo fans. He was just fantastic throughout the league. For fullfilling all our dreams. Does anyone know if season ticket covers New York Game? I think I know the answer already……..
New York Tommy – that’s no problem, just post the link in the comment. It’ll automatically go into moderation (because of the link) but I’ll clear it at this end. TonyK – you’re right that you do know the answer already. Sadly, the season ticket doesn’t cover the New York game. I voted for Aidan, but really it’s a toss up between him and Matty. Both were exceptional, but what swung it was Aidan’s footpassing which I can’t say I’ve noticed this in previous years but it’s been outstanding this league campaign. Perhaps given his positioning in the half forwards footpassing wasn’t on as an option for him as much previously. It really did stand out this year in a number of games. Matty to his credit has slotted in seamlessly to the team and is a special talent. Liam – your last line made me burst out laughing!! Yes that exactly how Aiden was on Sunday. A monster of a player and a man. Aido for me.Hes the true heartbeat and leader of this time and has been for some time.If anybody is in any doubt can you imagine if he got a bad injury and was out for a year? Hes the one player that completely irreplaceable. Keith Higgins was the next best for me.Some players start to lose pace at 27/28.Hes getting faster! but pace is only a part of his game,hes such a rolls royce of a footballer. Mattie Ruane the find of the league.I hope he keeps it up and believe he will. Thats just 3,Fionn,McLoughlin,Doherty Durcan,Clarkie,Hennelly and thats leaving loads out. By the way we started the league with a big problem at fb.It seems to have gone under the radar but Harrison has assumed that role and has been brilliant…..and Caff got a motm aswell! Agree with above on Aidan and Matty. And pray for an injury free season for them! If we assume for a minute that we don’t get Tom and Seamie back up to full speed, and we had an injury to one or other of Aidan/Matty, where then? We would presumably be back to some combo involving Vaughan (backup only for me at m/f), S Coen (not his natural position), Lee (again think we need him elsewhere) or Diarmauid (I would hate to have him there as while he’s excellent everywhere I want his phenomenal energy saved a bit for points and his knack for ghosting in for goals). I’m sure Management is considering another young midfielder or 2 – must say I felt a bit worried seeing no natural midfielder on the bench the last day (and loss of either of Aidan or Matty would really scare me against better teams). Anyone notice that little jink Kevin gave on the sideline before passing to Carr for his point? He got the ball in a bad position just on the line; in danger of being hooshed out over, the obvious thing to do was swing outside and head infield. Instead, he turned inside and slipped past his man while still hugging the sideline. Terrific skill. It has to be Matty Ruane. He’s the best find we’ve had in years. He could be a massive player for us later this year. He definitely shades it over Aido as he is very good in front of the posts. Ah shur lookit where would you be starting? I concur with the general consensus and tip my hat to Aiden but really the team is full of leaders and lads who just put the body on the line time and again. Matty Ruane is a dream come true and sure the options up front must help to focus minds… not just in the Mayo camp but any realistic combatants. I do love to see Aiden using his power and aggression cause he sometimes comes across as the easy touch. He really did give the impression that he’s tired of the Mr Nice guy and just letting it rip. 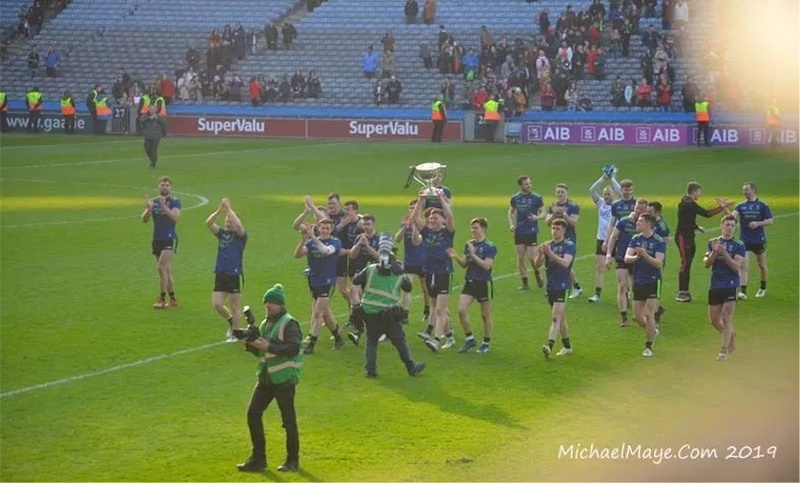 I posted before the league final that I was fed up of the losing tag, the broken heart and the shrug of the shoulder as I traipsed off outta Croke Park… well it feels like I’m not alone. This team shows signs that losing is not an option… we’ve done enough of that. It’s time to stand up and stick out the chest and play ball. Good on you Mayo. Good on our team and the ppl who make it tick… and us supporters too. Let’s continue to believe and enjoy the ride all over again. This is a new beginning…so yes it’s the team and management for me with a special star attached to Aiden O Shea… Amen!! I was looking at this year with 4 main targets. Stay up in Div 1, unearth 2 or 3 new or returning championship starters, seeing the older lads refreshed and in good form and win Connacht. Well we ended up winning the league and hopefully removing any psychological barrier we may have had with national finals. We seem to have found at least 2 definite championship starters (Ruane, McDonagh) with another host of possible starters (Plunkett, Boland, Coen, Reape, Diskin and Carr). 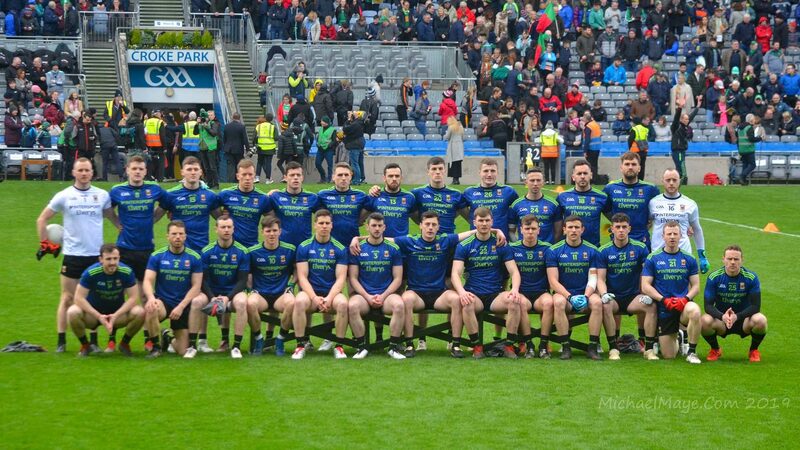 Lads like Higgins, Barrett, Doherty, McLoughlin and AOS (some are hardly “old”, but you’d almost call them veterans at this stage) look as fit, refreshed and ready for road as they have in years. Winning Connacht is the next step and whilst it will be difficult, we are well capable of it. Do that, enter the “super 8’s” and then let’s see where we go. There doesn’t seem to be any getting the run of ourselves after the league win, which is good to see. We are still a work in progress, but the signs are good and it’s nice to be in a positive frame of mind entering the championship. Aido, for hi leadership and consistently great performances. Only can be Aido! Consistent leadership throughout. Possibly in best physical shape of his playing career to date. Never complains about the abuse he gets on and off the pitch. Lets his game do the talking. Looking forward to summer. PS. Living in Galway you can tell the really bitter opposition supporter in the fact they don’t even mention the league final win by Mayo. No problem talking before the game! At this moment in time the two midfielder have scooped 87% of the votes. This is amazing as its not long since we were bemoaning the shortage of midfield options with Tom and SOS injured. We were hoping that Lee and Diarmaid might do a job for us. Matthew Ruane has been a super find for us and hopefully Aidan can keep his own great form going right into the championship. Boland only got a few chances but looked very good. May sneak ahead for Fionn for championship. Good to have both. Horan could play both Boland and Mcdonagh and hold Jason Doherty in reserve. Clearly there’s negatives to this, number one in my mind being Jason’s sheer strength on the ball, and work rate, something we cant get enough of from 10-15. Decisions will get even harder when one Cillian O’Connor returns and given his free-taking, it might mean Jason is the one to lose out. The one thing I like about Boland is that he has a great knack of getting in behind the cover. This will make him a goal threat. Great decision headaches for management to have. And free-taking also comes into it – if Cillian not on then we may need Jason for frees…..if Cillian back and In form you could see Jason being used to tear into it later in the game too – nice to have difficult decisions like this. Boland seems to be very attack minded when we have the ball. With very tight marking defenses hampering FF lines effectiveness, ghosting in with excellent timing is a really useful trait. Since Aidens been moved to midfield he’s been our best performer but over the course of the league it has to be Ruane .Complete midfielder Defentily in the Brian Fenton mould .Has learned so much from Aiden .I expect that he will get a little more unwarrented attention when championship begins but looks the type that will excel ,also has his guardian there for back up. I went for ruane but have no problem with Aidan winning. Thought Mattie deserved it as he only new to the senior team and he one of the top performers in all games. He played as if he a veteran of the team. Well done to the others also…. Just a thought going around my head this week Wouldn’t it be great if we could get a serious commitment from Irwin his left foot would be a great addition to the team. Ruane for me .. Covers back and forward …Midfield all about cleverness , work rate and mobility .. Some league from him .. If nothing else Aidan has silenced his detractors. Thought he was outstanding for us along with Ruane and admittedly I thought we would really struggle with midfield when the league began..In addition to being a fantastic asset for Mayo he is a genuinely lovely guy which was highlighted when he thought to mention Alan Freeman’s dad in his post match interview recently..
Catcol Ryan O’Donoghue is no longer on the panel. @catcol Since Kerry match in Kerry I think. Can’t say what I heard or I’ll be in the bad books. If a player is good enough and has the commitment then youd imagine he’d come back in, in due course, you’d hope. To make it at senior intercounty you need a lot more than footballing talent. You need absolute commitment and focus which for young lads means being mentally strong. The way I see it; if you’re fortunate enough to have been blessed with natural ability ood enough to be on the Mayo team, representing your family, your place, us, then you need to respect that. Theres a level of responsibility now that comes with wearing the green and red jersey. Well said Mayonaze. Agree completely. I’m just in from an 18th bday party and sometimes some things don’t come until a little older and most of us have been there. Age is great hindsight.